First some background. I have kept freshwater fish most of my life - not sure when I got my first tank but sometime in my early teens. As I approached my 50th birthday however I decided to make a change. I’m a hands on Australian bloke, in IT, with a bit of a Chemistry background, so I am reasonably comfortable with the technology and water chemistry etc. Obviously though I’m learning a lot more about the latter now I’m in the saltwater hobby. This journey started when I upgraded my freshwater tank light. My old T4 died and I decided to move to LED. 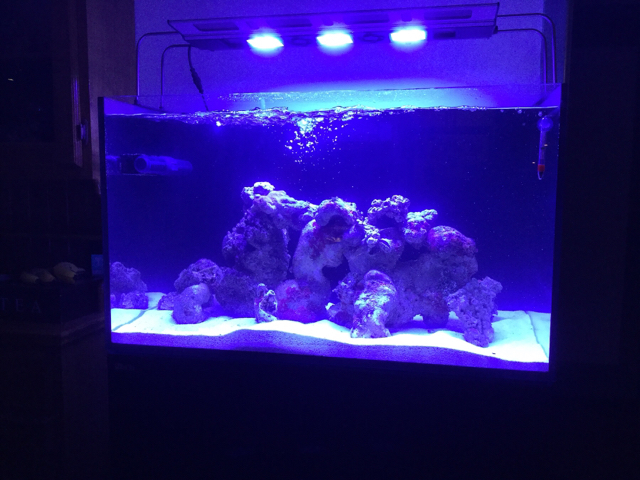 I bought a cheap LED light from my nearest LFS (Hurstville Aquariums) and soon had problems - lots of algae growth. 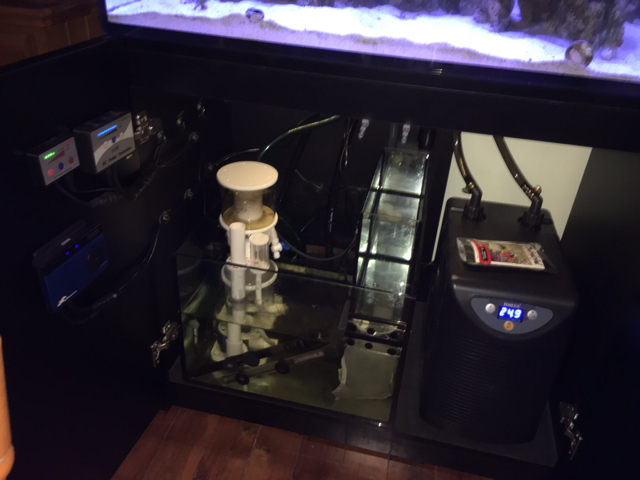 My son had just put together a great little freshwater tank using the Maxspect RAZR so I thought why don’t upgrade to that - better spectrum of light, should help me address my algae issue. Unfortunately I probably simply ran it too bright and things got worse not better. After a tank tear down and rebuild, only to have the same algae issues I was faced with a choice. Do I start again? Then I thought if I do that, why don’t I do what I’ve been thinking about for a long time and move to saltwater. I have a perfectly good Aqua One 380 to house the freshwater livestock that I know will work perfectly well. After checking with my wife that she was ok with what I knew would be a sizeable investment the answer was yes and I got to buy myself an early 50th birthday present. The starting point was to re-use my Maxspect RAZR 420 light. Here is the freshwater crew’s new home. 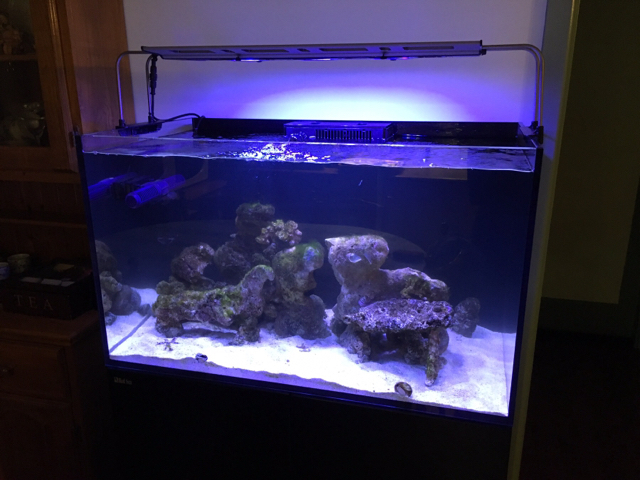 At the end of October 17 I approached another LFS, Majestic Aquariums in Taren Point, Sydney, to get some advice. The tank was going to go into a specific place, so size was a constraint. They had two good options which were the right width - Cade and Red Sea. The Cade was really too deep however, so the Red Sea Reefer 250 was the weapon of choice. I then emailed them asking the owner, Paul Talbot, to advise me what I needed to set it up, and the cost. He quickly replied with my laundry list, which included upgrading my RAZR to marine clusters. I also pay them to deliver and assemble it all for me. I already have some idea of how much I need to learn so let’s start by picking their brains! I head instore to pick up what I can when it is ready, and chat to Luke and the store staff. 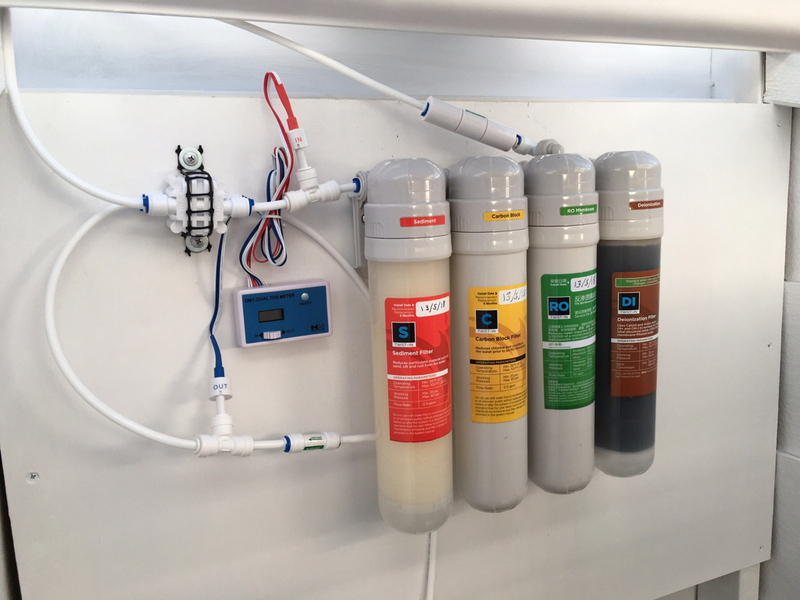 Luke recommends Aquaforest and at this point I am happy to take the expert’s recommendations, so that is my starting point for salt and dosing solutions. As I wait for delivery I continue my self learning - I devour the BRS 52 week series, lots more YouTube videos and start scouring the wonderful forums such as this one. My initial thinking for cooling was to use a thermostatically controlled fan, as I (mistakenly as it turns out) didn’t have room for a chiller in the ‘250. So I buy some bits on eBay in preparation. Part 2 - the tank is installed. The tank arrives on Saturday 23 Sep 17. Emilio installs it and gives me lots of great info. In goes (tap) water and salt. Marine Pure balls go into the first return section, and Polyfilter into the final return chamber with the pump. For the first cycle I am not going to bother with RO. From now on however, it is RO all the way. A couple of 30L barrels are already in the spare room waiting for RO, which for now I will source from Majestic Aquariums ($7/30L). The rest of the day is spent fitting and mounting equipment. I realise the 250 has a dedicated chiller compartment, so after another chat with Wifey we decide to invest in that. Next day I am back at Majestic to buy the chiller, circulation pump, RO water and 20 Kg live rock. Another day is spent finishing the install. First week I don’t bother to test much, just keep an eye on it. I look at my initial aquascaping and feel it needs an improvement. 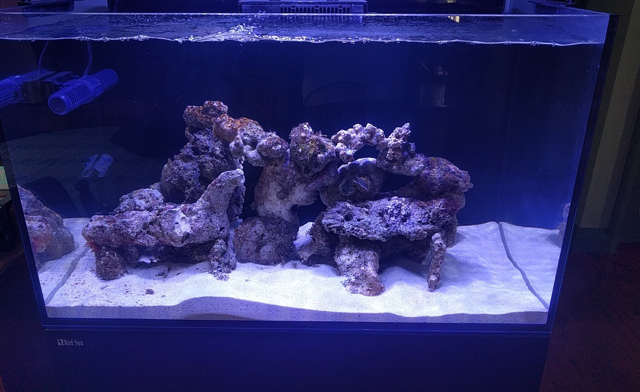 I figure if I lift the main rocks off the ground and prop them on smaller ones I get nice caves and water flow, and I also decide I need some lower height shelfs in the front to give me flexibility to start placing corals. So another 3 Kg of live rock goes in on Sat 30 Sep and the design is altered. Much better. I’m also playing with the light cycle and the wave maker cycle. I put the light onto a roughly natural sunup/down cycle, with moonlight overnight and the wave maker onto what to my mind might simulate a tidal cycle. I start testing water every couple of days and see the cycle progressing. I’m using the LFS branded bacterial culture to help this every few days. 2 Oct I am up to 10 ppm Nitrates, Ammonia is 0.25 ppm and Nitrites are already starting to drop. 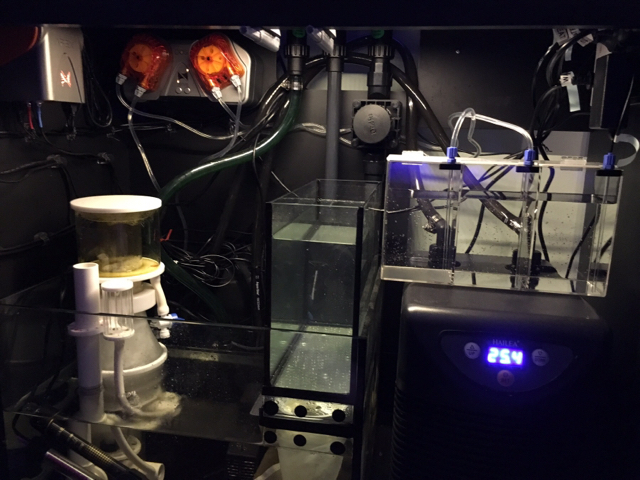 Very impressed by the overall filtration system as this has cycled faster than I expected. 7 Oct Ammonia, Nitrites and Nitrates are all 0 ppm. Salinity at this point is 1.023. Fantastic! Tank is looking good, might want to think of making a vent of sorts in the side of the cabinet. The cabinet will get very hot in there with the chiller going, the tank looks like it is quite close to the wall. How are you finding the Gyre?, i am currently running an MP40 and some tunze pumps but thinking of switching the Tunze's out when i finish setting up my new custom 5x2x2. 8 Oct 17. By now I’ve only done one 8L water change (just to clean filters), so I do another. I bring salinity down to 1.022 and start introducing the first livestock - a sand sifter Starfish (first mistake! ), 2 Turbo snails and 1 Trochus snail. At this point I am thinking of water changes, so grab an another couple of barrels - a 30L and 25L one, as well as a small dolly (plank of composite wood on castors) which I can sit both on. I figure I can fill the large barrel with RO, add salt, a small old heater and a small old circulation pump and bring it to temp and mix. This one has a wide lid. The 25L has a small cap which I drill a 20mm hole in, enough to admit the hose from my gravel cleaner. I am also planning for the maintenance and my wife Jenny has agreed I can take over part of the spare room. A trip to Ikea ensues and I start to build out my aquarium room. Here's what it looks like now. On 15 Oct I do my first large(ish) water change, 25L, and add 2 Hermit crabs. The dolly design works perfectly. As it sits in my spare room I add my salt, pop in the heater to bring to temp and the pump to mix. When ready I disconnect the electrics, roll the dolly over to the DT, place the small barrel on a chair, turn off the return pump and wave maker and clean my sand. Placing the end of the gravel cleaner into the hole in the small barrel cap works well and holds it firm enough that there is no risk of water splashing. 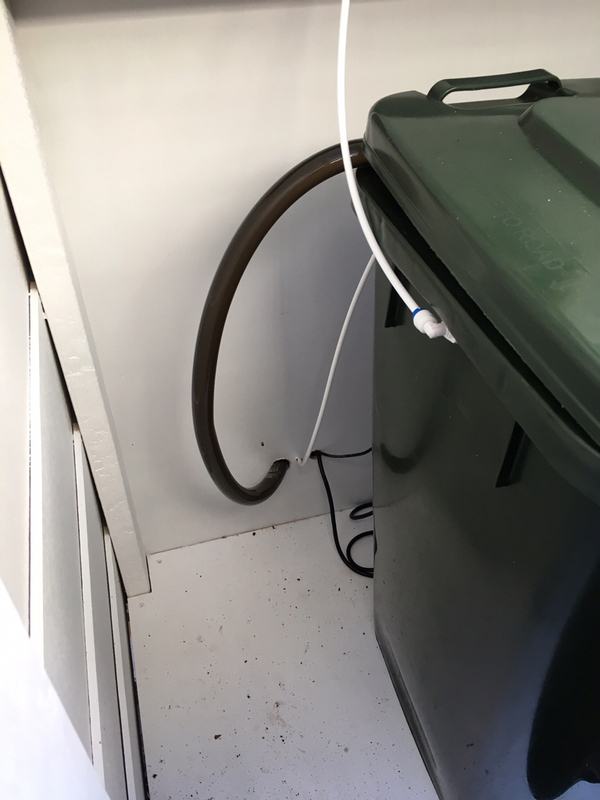 When the small barrel is full I attach a flexible tube to the outlet of the circulation pump (which is still in the bottom of the big barrel), plug it in and start pumping fresh saltwater back into the sump and turn the return pump back on. As the return pump, even at it’s lowest setting, pumps faster than the circulation pump can introduce water I pause it every now and then to stop the sump running dry. 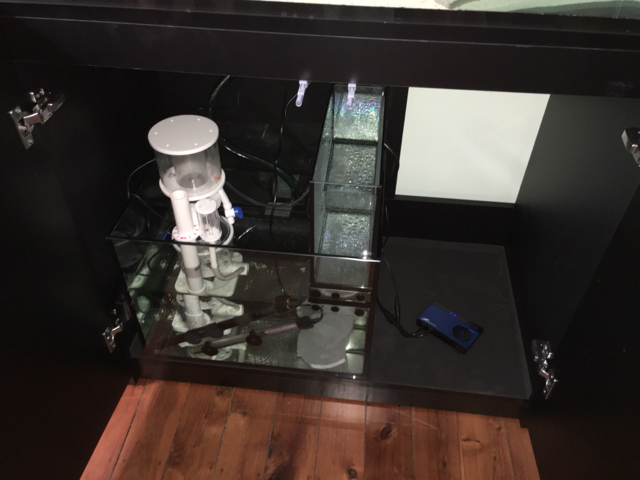 As I want to raise salinity a little I pump all the 30L into the tank and leave evaporation to do it’s thing. In the future I will mark a line on both barrels and adjust levels before I start so I know I am replacing exactly what I take out. I then open the tap in the small barrel, put some tankwater in a bucket and start cleaning my sponge and Polyfiler. All in all I’m pretty chuffed with myself - my design worked perfectly. The next day I have my first fatality - one of the Turbos hasn’t made it. Not completely surprised as I know I’m moving fairly quickly but unhappy nonetheless. I’m now starting to monitor my Alk, Ca and Mg, and starting to dose a little bit. I quickly figure out I don’t really need to add much if anything at this stage. 21 Oct and the first fish go in - a pair of Clowns (Nicole and Tom) and an Anemone. They go in well, the Clowns already know the Nem from the LFS and all are happy. All came from 1.024 water so a direct introduction seemed safe and turned out so. 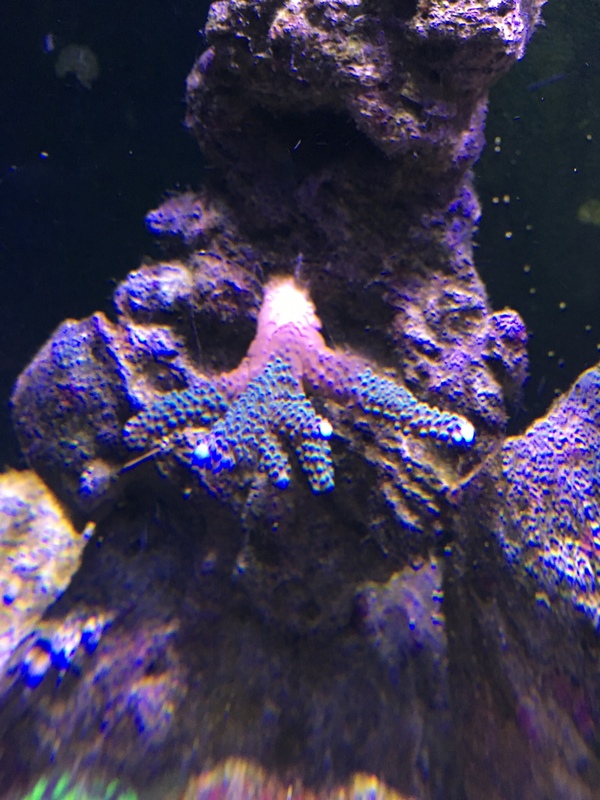 23 Oct and I notice the Starfish is starting to shrink. This ultimately turns out to be my first mistake and a lesson learnt. The poor guy ran out of food in the sand, I had not done enough work to transition him to pellets and he ultimately starves to death. Much self flagellation follows. 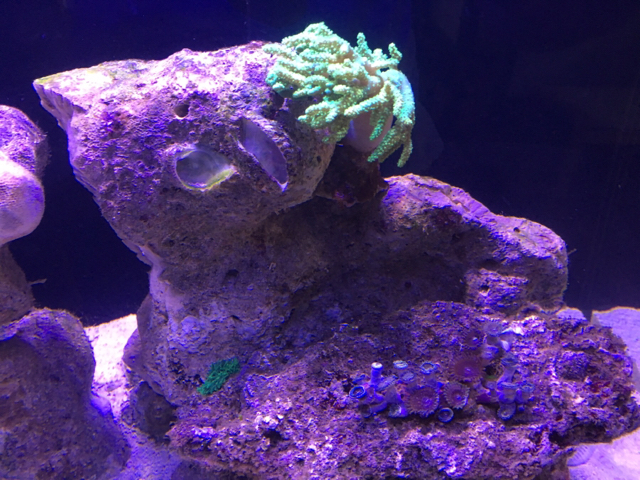 29 October I add my first corals - a Neon Green Australian Sinularia, a Purple Zooanthid (think this may be what is called a purple people eater) and a brain coral. Here is my first ask of the community - I would love to identify these corals correctly, so if any one can help with the correct common or scientific names I would love that! Thanks for the reply. I am keeping an eye on the heat but so far so good. The tank is quite close to the wall but the right hand side wall (the side the chiller is on) ends in a doorway only 3 inches from the tank so the airflow seems to be sufficient to evacuate the hot air when the chiller is running. Our summer hasn’t been too hot this year so the chiller is not running that often. 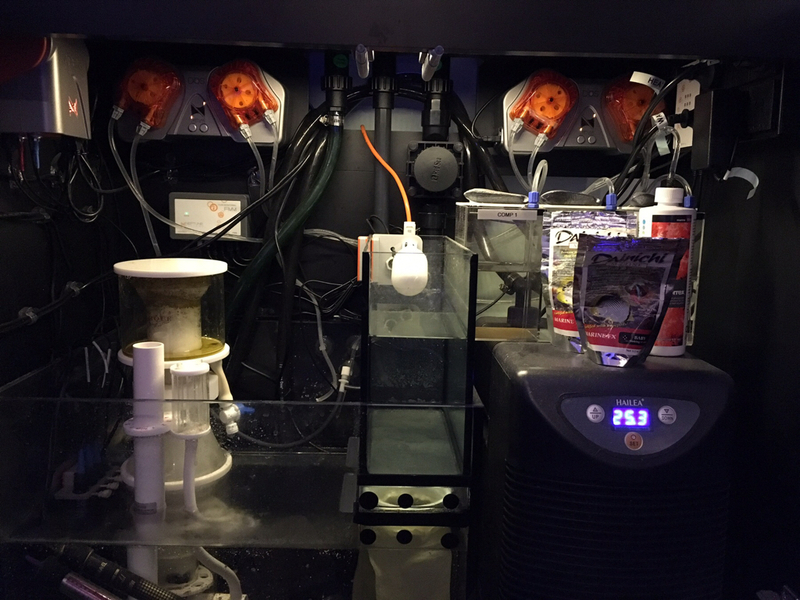 If I think it becomes a problem I may place a small computer fan at the back right of the sump, controlled by my Apex, and turn it on anytime the tank gets to the temperature I see the chiller kick in. I am not operating the chiller from the Apex, leaving it’s internal thermostat to control it, but I can see from the Apex when it kicks in. The chiller’s thermostat appears to read slightly higher than the Apex. That should move any heat buildup when the chiller kicks in. So far the Gyre is going great. It’s 6 months old now, and no issues so far. Overall water flow in the tank seems pretty good, but it’s still very early days. I clean the housing with a toothbrush weekly and disassemble and clean more thoroughly every 3 months. I’m keeping an eye on calcium buildups to see how often I need to soak it in vinegar - ok so far. Thanks for the feedback. I guess I’ll see how mine goes. I do like the fact I only have one piece of equipment and associated lead in the DT with the Gyre. Nov 17. The tank is progressing well at this point - seems to be settling down and establishing nicely. Then the Nem decides to move and isn’t eating. A couple of weeks later the poor Nem is no more. My limited research suggests that instead of putting a Nem in early and letting it find a spot before I start placing the sessile corals was not a good idea as my system was simply too young to provide the stable parameters the Nem needs. So lesson two goes into the memory bank. About this time I decide I need a QT. After some research and checking I settle on the Aqua One Reflex 35 which ends up being a great choice. It has rear filtration with 4 chambers, inlet, ceramic noodles, sponge and return. I remove the filter section cover and the sliding glass lid to let me mount the rest of my hardware. A homemade container with an ATO kit and a fan on a gooseneck for cooling connected to the thermostat I originally bought for the DT completes the setup. By now I am looking into dosing options and controllers. Despite the massive markups for this kit for us Australia based reefers (we pay about 2x what you US based reefers pay) I decide to invest in the Apex, and 2 DOS units to cater for the 3 part I am dosing. The DOS reservoirs look great but I simply can’t justify the cost so I find a nice 3 part acrylic reservoir I can get from a local supplier and go with that. The Neptune kit is on order and ultimately takes about a month to arrive. About a month earlier I made mistake nbr 3. I saw that Hawaii was changing it’s export laws and the Yellow Tang market was about to dry up. I had planned on a tang so that sparked me to grab one now whilst I could. What followed was a massive rookie mistake. Firstly let me pre-empt the Tang police. 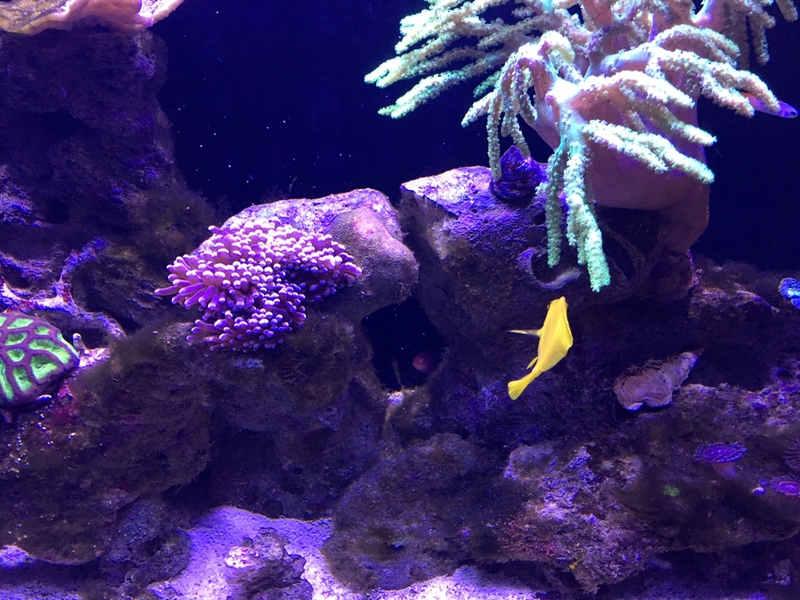 I know a 3’ tank is too short for a long term Tang, even the smaller yellow. My intent is to introduce a juvenile and once (and if) I find it outgrows my tank, I have a great LFS with lovely display tanks who will take a refugee. Please don’t castigate me too much. In any case my rookie status meant this was not an issue. I got the Tang from my LFS who I got the Clowns from. They came from 1.024 so the Tang will, right? That means I can acclimatise directly without the QT. I don’t have a lot of existing livestock to protect so the risk is low. Right? The Tang of course is in 1.020 water not 1.024. The only reason the Clowns were in1.024 is that they were with the Nem. So Plan B comes in and I do a 2 1/2 hour drip acclimate. That should be enough shouldn’t it? The Tang goes into the DT well and looks ok. Very active, swimming everywhere. I think he is happy and inquisitive. Wrong again. What he is is stressed. 4 day later he has passed. The self flagellation from the Starfish is ramped up 10 fold. My amateur diagnosis is Osmotic shock. He simply could not cope with the sudden increase in salinity and as much as his body tried to adapt, it could not cope and the organs eventually shut down and gave up. At least from this I know what my Piscene introduction strategy is - QT and a very gradual increase in salinity. Part 5 - More investment. Dec 17. My Neptune Apex has arrived and a weekend follows happily tinkering. 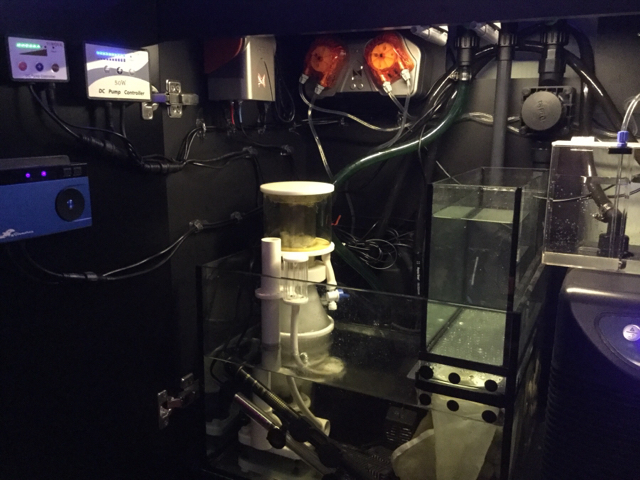 By Sunday lunchtime I have managed to mount it all in my sump, get everything connected and setup the basic programming. Initially I only got one DOS pump as the other was still on backorder, but I was able to get the mounts on both sides of the tank ready so when the second unit arrives I can pop it straight in. I also sourced a 3 chamber acrylic dosing solution reservoir from a local supplier and have room on top of the Chiller for this. The photos below don’t show the second DOS unit, but it is now installed on the right hand side just like the first on the left. 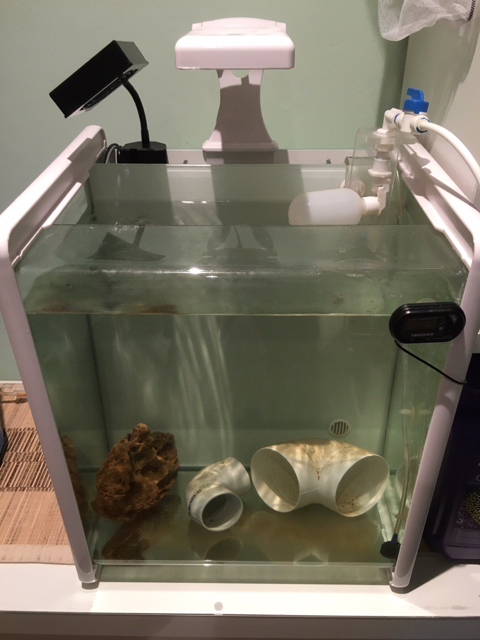 I have to say I am very impressed with the Redsea sump design - as I don’t have the luxury of an adjoining room I can put hardware in everything needs to go into the sump. So far so good, and still some room for expansion. Down the track I plan to put an RODI outside the house next to the tank room and plumb that in under the floor to a Neptune ATO kit. I then plan to convert the stock ATO tank into a refugium. For the rest of the year I leave the tank to settle down, and we have our yearly camping holiday on the North coast of NSW (Stuart’s Point). Part 6 - Stocking time. As my wife and I work Mon-Fri this works well and lets me introduce new fish over a 2 week period. 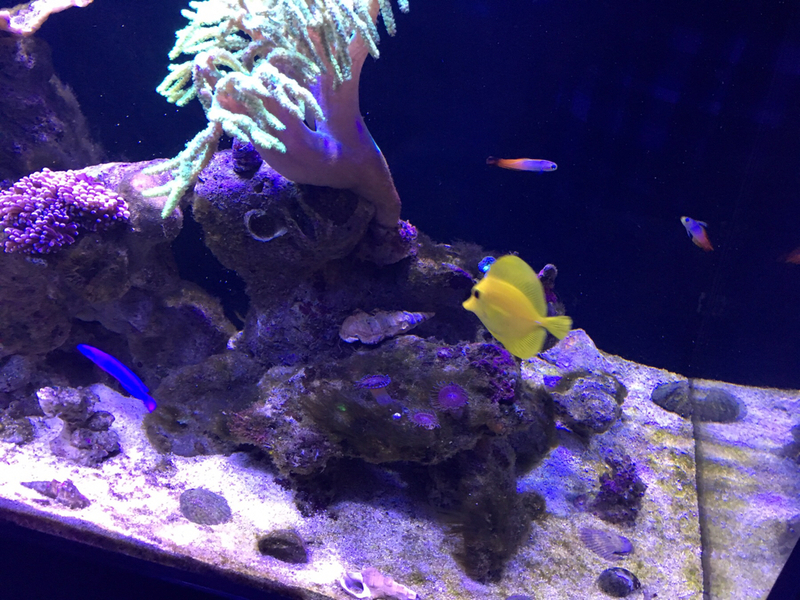 The first two that go in are a Yellow Tang and a Bluestreak Cleaner Wrasse. They are best mates from day 1 and both transfer into the DT successfully. No sign of Ich or any infection throughout. Next an Orchid Dottyback and two Fire Gobys go into the QT. This goes well but just over 1 week in the Dottyback has a lesion on it’s LHS. The QT salinity is nearly up to 1.024 by this time so I quickly finish that, move the two Fire Gobys over to the DT and over a few days drop the QT back to around 1.021. The Gobys transition well so I now need to care for the Dottyback. 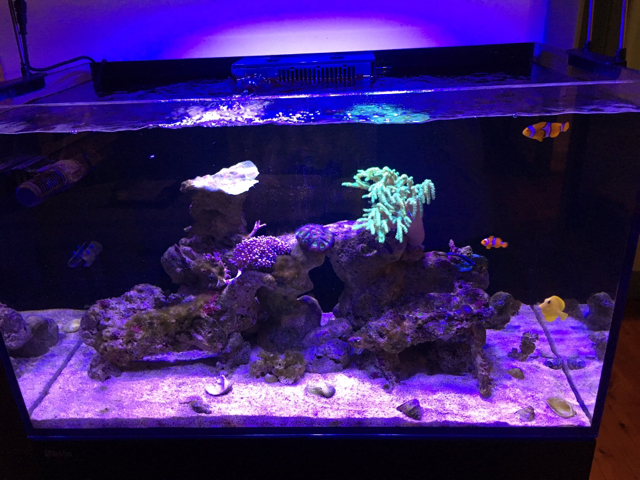 I sought some help from this community (http://www.reefcentral.com/forums/sh....php?t=2666957) and got some fantastic suggestions and information. Even though I have kept freshwater tropical fish for a long time, I stuck to the regular fairly robust ones, and had not had much cause to look into Piscene disease treatments, and of course not Marine ones. I quickly find out that many of the options open to overseas reefers, particularly those in USA, are simply not available to us in Australia. In particular antibiotic based remedies are not available locally. I don’t know exactly why, but our bio-security laws are probably a big part of the this. Whilst I consider sourcing MetroPlex and/or Kanaplex off eBay I end up just sticking with the treatments I can source easily. I initially dosed Cupramine on the theory the lesion may have been caused by a parasite, so the Cupramine would kill that and allow the fish to heal. I consider using Melafix as it appears to have some effect on some bacterial infections, but my LFS suggests it’s a waste of time, so I don’t try that. I do start adding Voogle to help the fish’s natural immune system. 1. I can source MetroPlex and Kanaplex from a Melbourne based eBay seller. They have a shelf life of 3 years so I invest in a packet of each in case of future infections. 2. I didn’t see any lesion on the fish when I bought it but will be doubly careful inspecting any future livestock. 3. I had a dead rock in the (bare bottom) QT and it’s possible the Dottyback tried to burrow under it, hurting itself in the process, so that rock will be taken out for any delicate fish in future. All the other fish are going well in the DT. Feb 18. The next fish to go into the QT is a Sixline Wrasse. Within a couple of days and more research into them I realise this may be a big mistake as they appear to have a habit of developing into bullies. I’m not willing to take it straight back to the LFS however, so for now I am going to persevere with it. I hope that as I am fairly quickly stocking a number of juveniles that they will develop and grow into a happy community together. I expect to have the tank nearly fully stocked within 2-3 months at this point. The Sixline completes it’s QT and goes into the DT. So far so good, not seeing any signs of aggression, but of course that may change. Time will tell. The Bluestreak Cleaner Wrasse disappeared the day after the Sixline went in, but a few days later emerged again and seems happy. Then he disappears. After 2 weeks and no sign of him I have to assume that he jumped out of the tank and was picked up by our 11 month old Cocker Spaniel Bob whilst we were at work (Bob has the run of the house when we’re out via a doggy door). I assume this as I saw no sudden drop in ORP and no sudden algae bloom which should have happened if he died in the tank. Another pointer to this is that recently I had been cleaning saltwater drops from the outside front and side of the tank regularly - someone was splashing and it may have been him jumping. I have not however seen any for a few weeks now. It also makes sense to me that if he was nervous due to the new Sixline that may have made him more likely to jump. I had already rescued Nicole (female Clown) a few weeks earlier after she jumped on a weekend whilst I was home - lucky enough to walk past the tank and see her on the floor flapping. She (and we) were extremely lucky and she went back in without any adverse effects. So I had already started looking into tank covers. After some research and checking with a local acrylic provider I decide to pay the bucks and order a custom top from Artfully Acrylics over in the USA. The feedback on this forum and the product displays on their site are too much to ignore. So A$380 later (delivery is nearly as much as the lid) I have one on order. Hopefully it will arrive in the next 4 weeks before we take another week’s holiday. The tank is going quite well, and 7 months on quite a few things have changed. My lid arrived and is great, I have battled and now hopefully beaten a GHA plague, and as part of that made a mistake with Lanthalum Chloride and knocked over a Torch coral. I setup an RODI and permanent ATO with an outside reservoir which is working great. I’ll post a few more substantial updates to bring the thread up to date with the journey along with pics in the next week or three. Part 8. Corals and Inverts. I’ve been slack and not updated this thread, but @SereneAquatic prompted me to extract a digit and bring it up to date. Mar 18. As I’ve been going through the process of stocking the tank I’ve been adding a few corals and inverts. Some of the corals are going ok, some not so. My Torch coral went in with 3 heads back in Nov 17. Two of those heads have been fantastic, but the third was never as strong and mobile as the others, and after a couple of months I lost all of the polyps on that head. The other two heads seem good however. My orange Zooanthid was initially happy but then stated to atrophy and eventually all the polyps died after a couple of months. My purple Zooanthid is also doing it a bit tough. It was ok for the first 3 months but from then on it started to look moth-eaten and I have lost a few polyps. I decide to pause adding any new corals until I have the tank stocked and more stable. The inverts have been doing well however, and at the moment I have one Hermit Crab, one Coral Banded Shrimp, one Nassarius snail (that we only see once every few weeks), one Trochus snail and a couple of hitchhiker slugs that are all doing well. 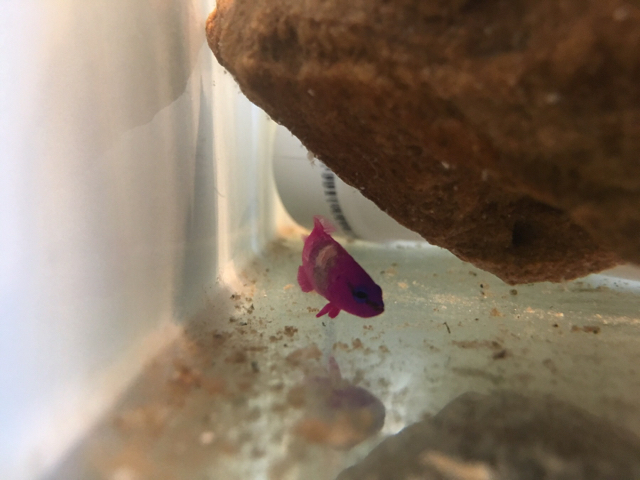 I now have a second Orchid Dottyback in the QT, has been there a week and is having it’s salinity raised. This one is going fine, no sign of infection or parasites, so I am hopeful he or she will be in the DT next weekend. After that the plan is to add a Bluestreak Cleaner Wrasse, Blennie of some description, Sand Sifter Goby and possibly 2 Bangai Cardinalfish. Apr/May 18. During April I finished the initial fish stocking and the Orchid Dottyback went into the DT successfully. I have started to see Green Hair Algae growing through the tank and decide my low water change approach I have been taking is probably part of the problem, with Phosphates starting to build up. So I move back to a 4 weekly 15% WC schedule. My testing to date for Phosphates has been based on an API kit, which I know is not accurate enough for what I need, so I get a Red Sea kit and start with that. My son suggests Phosguard to reduce Phosphate so I give that a go in a media bag in the sump. Initial tests indicate 0.12 PPM Phosphates, and that then reduces in a week or so to 0.08 or a little lower. It stubbornly stays there. I test my tap water and it is also at 0.08 and the LFS RODI I am using which is also 0.08. Stupidly I miss the obvious and think maybe the LFS is skimping on their media changes. I keep changing Phosguard and my Phosphates never drop below 0.08 PPM. I was always planning to buy my own RODI unit, so this is a good reason to pull the trigger on that. It is bought, temporarily setup out the back and I no longer have to cart barrels of water home from the LFS. More on this later. At the end of April I introduce a Lawnmower Blenny to the tank which completes the initial stocking. We absolutely love Benny - so much character! Around the same time my cover from Artfully Aquatic also arrives, and is beautiful. Off goes the temporary flyscreen cover and on it goes, fantastic. We then go away for a week, and before that I do two things. Firstly I buy a Neptune AFS to keep the wet pets fed. Secondly I buy a Neptune ATK and setup a 30L barrel next to the tank to keep the tank ATO full. Temporary, again more on this later. When we get back however the GHA is getting out of control - overfeeding by the AFS appears a very likely issue. The fish are happy, but the tank and corals not so much. Jun/Jul 18. My GHA issue is not really improving, even with the Phos-Correx dosing and manual removal. Despite this I am continuing with my Invert stocking, and now that I have a full fish load I add another Sand Sifter starfish. Hopefully there is enough going on in the tank to keep him well fed. I also introduce another BTA for the clowns. Both seem to settle in ok. The BTA (which was a fairly large specimen) splits after 2 weeks. I put this partially down to the stress of moving to a new tank, but both animals do look very healthy, so I’ll keep a close eye on them. Over the next month everything is fit and well, unfortunately that is also true for the GHA. In July the penny finally drops. 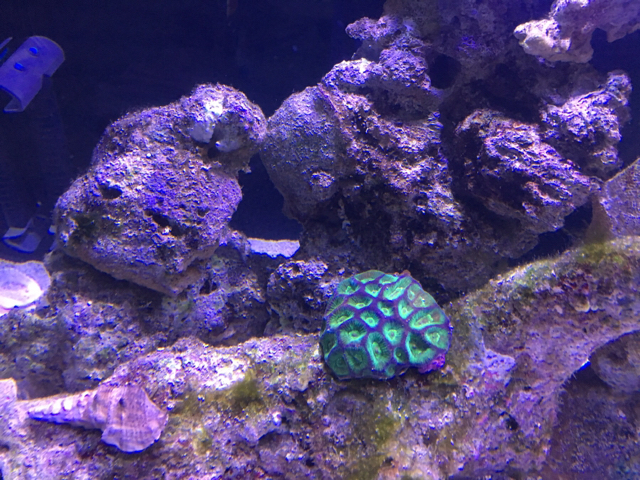 My Torch suddenly starts looking very unwell, and our healthiest coral, the Neon Green Sinularia is also taking a big turn for the worse. What is the problem? Suddenly my problem is very obvious. Bad test kit. My Phosphates were never 0.08 PPM, they have been 0.00 for a long while. A big lack of nutrients for the corals and I have now killed at least one. I immediately stop with the Lanthalum Chloride. An investment in a new Red Sea Algae Pro kit follows. The Phosphate test is different in this one, so Red Sea must have changed their testing approach. Annoyingly my Apex doesn’t match the new colour wheel so I have to change that back to a test kit ‘none’ and enter results manually. This kit however is showing 0.00 Phosphates, but Nitrates above 4 ppm. Now everything is making more sense. My wife brings me home a scalpel and blades and I remove the unhealthy one of of the 3 arms of the Sinularia. I initially try to frag the healthy bits of the removed arm, but am too inexperienced and none of them end up surviving. The rest of the Sinularia however starts to recover. Unfortunately the Torch is a goner. 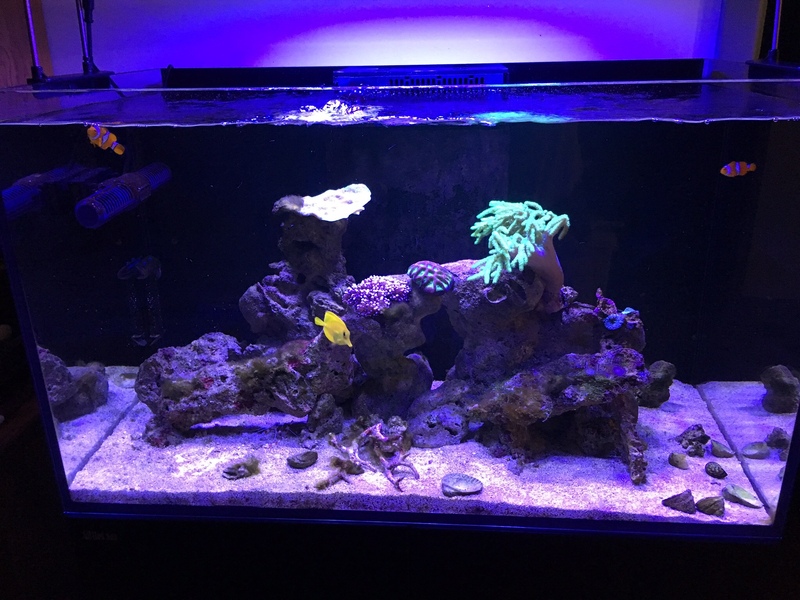 Next step is to take another of the LFS team’s advice (the younger crew have some different ideas to the older owner) and move to NoPoX to control my nutrients. This also solves a problem I had been facing, where I was trying to decide what my long term nutrient export approach would be. 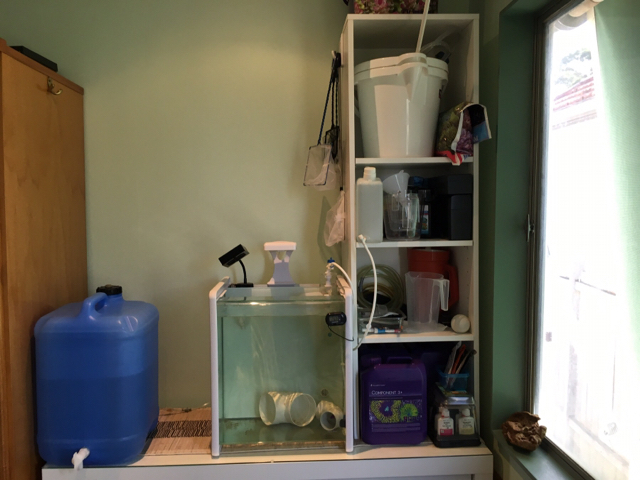 I don’t really have room for a Refugium but if the NoPoX works it may be a long term solution for this tank. Last edited by Tastee; 10/25/2018 at 02:03 AM. Jul 18. During July I had time to complete my RODI setup. I have now moved it from out the back of the house to the ‘dead side’ next to the room my tank is in (~10’ away). It is mounted in a custom made enclosure to keep it dry and neat. This is intentionally oversize in case I want expand to a second tank later. Our house is a single storey timber frame house on a longish block, built on brick piers. This gives me good access to the timber floor and I have run plumbing up through that to the tank. I spent a fair bit of time on this design and happily was able to go back to my preferred approach - KISS. My design criteria were as follows. 1. Automated ATO from the RODI reservoir. I never want to have to fill the ATO again. 2. Access to bulk RODI water supply inside the house. 3. 4 week’s water supply. Instead of a complicated electronic solenoid array to turn it on and off, I have used the Aquatic Life physical pressure sensitive solenoid. Instead of a complicated bulk supply method I have a simple 240v lead to turn on a pump in the reservoir which is controlled from inside the house. I have found that the pressure sensitive solenoid is a little noisy on shutoff, so have sheathed the inlet line in insulating foam which helps. I also realised I don’t want to run the RODI too often so have programmed the Apex to only draw the ATK from the reservior once per day at midday. In normal operation I keep the supply tap to the RODI turned off and only turn it on once every 2-3 weeks to fill the reservoir. If we go away for an extended period I can leave the supply tap on and it will only annoy the neighbours once per day at midday. So what are my possible problems? 1. RODI does not shut off and overflows the reservoir. It is located outside and will drain away so not a problem. 2. ATK overfills the ATO. The Neptune has 3 levels of redundancy built in, and alerting on top of that. More belts and braces than the critical computer systems my team manage in my day job ferrying train passengers around Sydney! 3. Red Sea ATO stops working. The most likely issue I will face. Optical switch will alert me to low levels. Further redundancy in the Apex program for the ATK. Clean the float valve regularly. Document cleaning process for house sitters. 4. Overflow for unknown reasons. Floor leak sensor to detect this. So whilst we are home to check things every few days it seems pretty safe. If we go away for an extended period I need to give the house sitters a checklist to be safe, but only once or twice a week checks are required. It’s now 3 months later and it is all working perfectly. Part 12. Getting GHA under control. Aug/Sep 18. The last 2 months has been all about getting my GHA issue under control. At the start of August I had Nitrates > 4 ppm but < 10 and Phosphates at 0.01 ppm and was dosing NoPoX at 4 ml/day. I must say I am now happy I invested in the Apex and two DOS units - expensive, particularly in Australia, but worth it. They let me spread all my dosing over a long period to try and make changes gradually and maintain stability. My current dosing schedule is as follows (I use the Aquaforest 3 part solution). By 18 August my Nitrates had dropped to 4 ppm. 1 Sep they were 1 ppm at which point I dropped my NoPoX dosing to 2 ml. At the end of Sep they were 0 and 0 so I dropped NoPoX to 1 ml. I want to keep them low for now until the GHA is under control but my target is ~0.5 ppm Nitrates and 0.02 ppm Phosphates. I am not aiming for an SPS dominant tank, but I want to be able to keep some in a mixed reef tank and this seems to be a good target to start with. I have been doing a fair bit of reading about this and the amount of material out there, and the differing points of view, are staggering. Enough people seem to favour my approach however that I will stick with that for now. 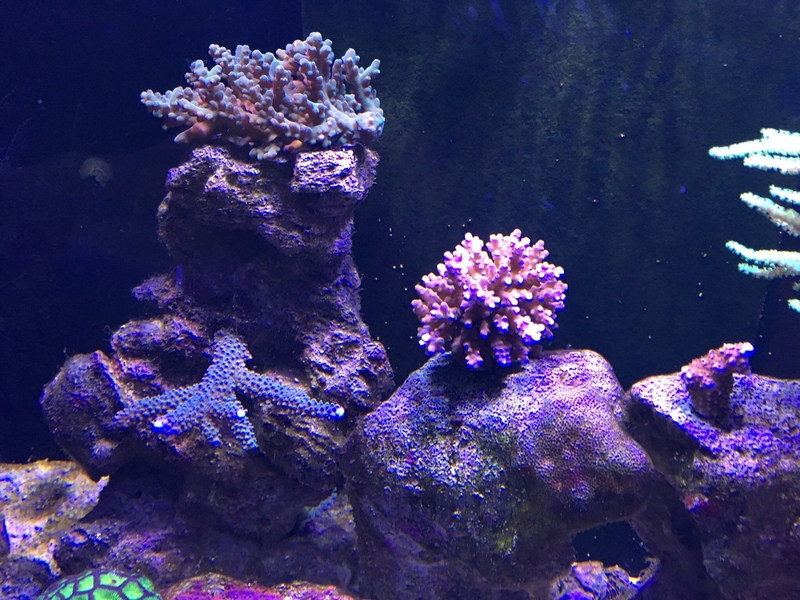 In late August I added three more corals - two Gonipora and a Hammer. I moved one of the Gonis from it’s original location and it seems to like it’s new spot much more. All other animals are going very well - lost a couple of CUC snails and 1 fish. The Nassarius snail and the Sand Sifter Star are both going great guns which we are rapt in. The fish we lost was one of our Fire Gobys. Just disappeared one night. Initially I thought the culprit may have been a hitchhiker crab I have seen at night, so I got a crab trap to try and catch him. Put it in the tank one night with 1/2 prawn, within 45 mins I hear noise - aha! No, it was just Crazy, our hermit crab who had managed to squeeze himself inside the trap. So I remove him, put him on the other side of the tank and go to bed. The next morning I have caught...Crazy again. He is definitely Not Happy Jan. I take him out and he sulks for 2 days. If I want to try again I’ll need to relocate him to the sump for a night. I spend more time watching my hitchhiker crab at night. All I can ever see him eating is Algae, and with my GHA issue I can hardly take issue with that! Feedback on the forums is also saying that the culprit is more likely the other Fire Goby, so I decide to leave the crab alone and see how things go. 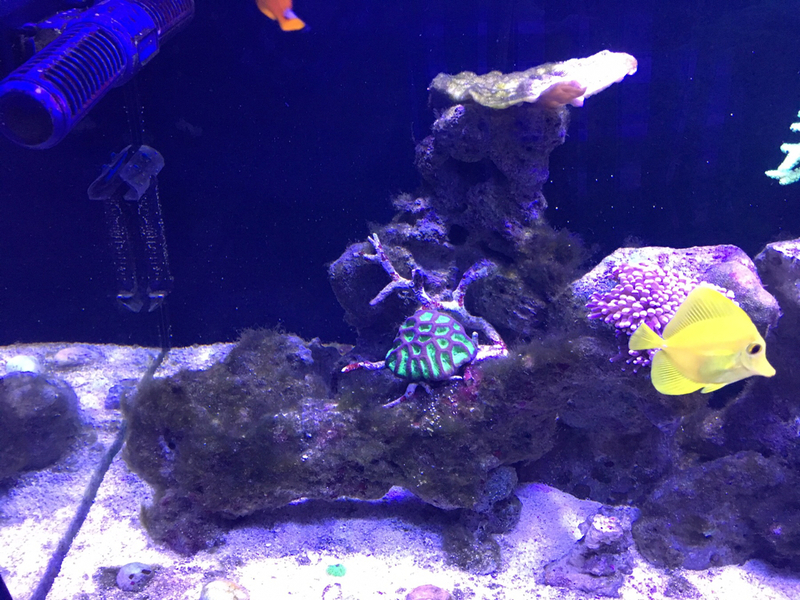 I have not seen predation on corals, and the other fish are all fine, so maybe I am blaming he poor little crab unfairly. In mid Sep I ramp up the GHA attack - toothbrush inside the tank several times a week. The first time I did it I was a bit hesitant, but it cleared up quickly and well, and none of the inhabitants seemed the worse for wear, so I have kept going. I am cleaning my filter socks and skimmer very regularly, but apart from that doing nothing other than my normal maintenance and it seems to be working. Here is a video. Ignore the SPS - I’ll get to them next month. Looking good Tastee, any updates? I live in Sydney also and found that Majestic Aquariums are a very expensive LFS compared to a lot of others around, but they do have a great store tho! Hi Elijahh, thanks for the comment. I’ll post an update below. I do like the staff at Majestic, they are all fantastic. I am sharing the love however - buy most of my livestock from Hurstville Aquariums which are a small but quality operation and very near my home. I am also buying other supplies from Aquaristic in Roseberry. They have a really good big store and a great online site, and are reasonably convenient for me to drop into on the way home from work. I just picked up a batch of stuff today - filter socks, test kit refills etc. Their livestock looks fantastic but I haven’t purchased anything yet. PM me if you want any more specific feedback. Part 13. SPS. And power outages. 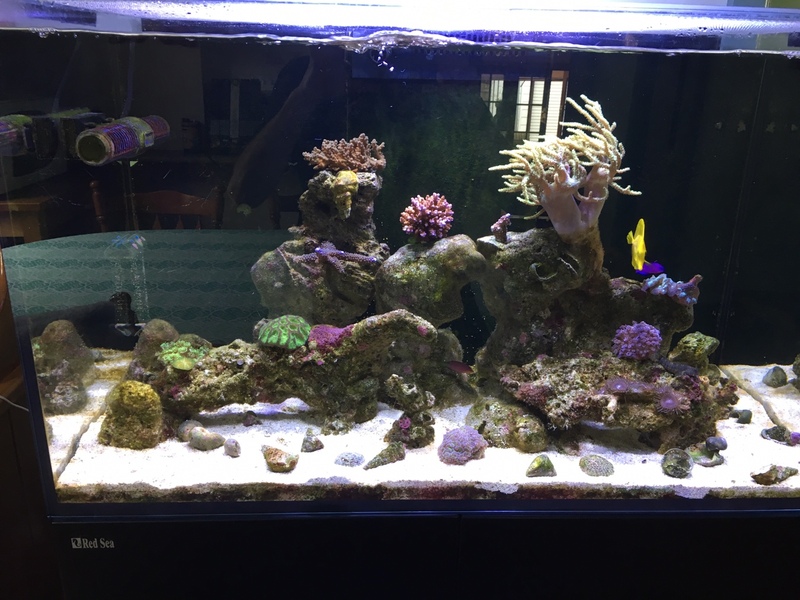 In October I decided my tank is now stable enough that I am going to try a few SPS corals. I am not aiming to have a lot of SPS in my tank, are happy to fill it out with LPS and Softies for the most part, but I have a few spots in my aquascape that are crying out for stonys. 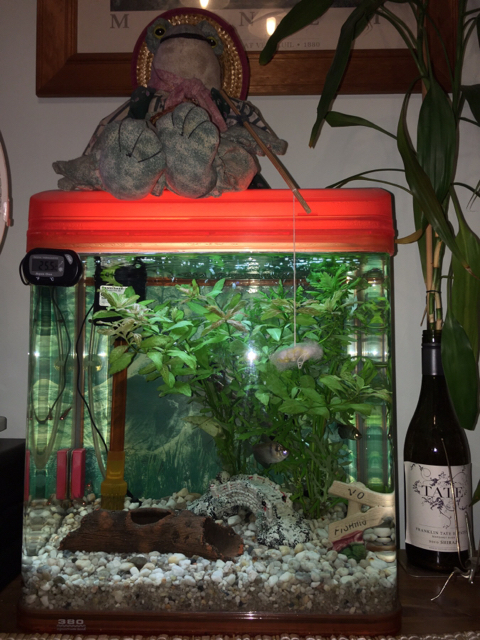 We drop past Majestic Aquariums after walking our dog on Sunday 7 Oct since it is nearby our walking spot and find they are breaking down one of their SPS display/sale tanks, and buy 3 mature specimens for $100. Seems like a reasonable deal. 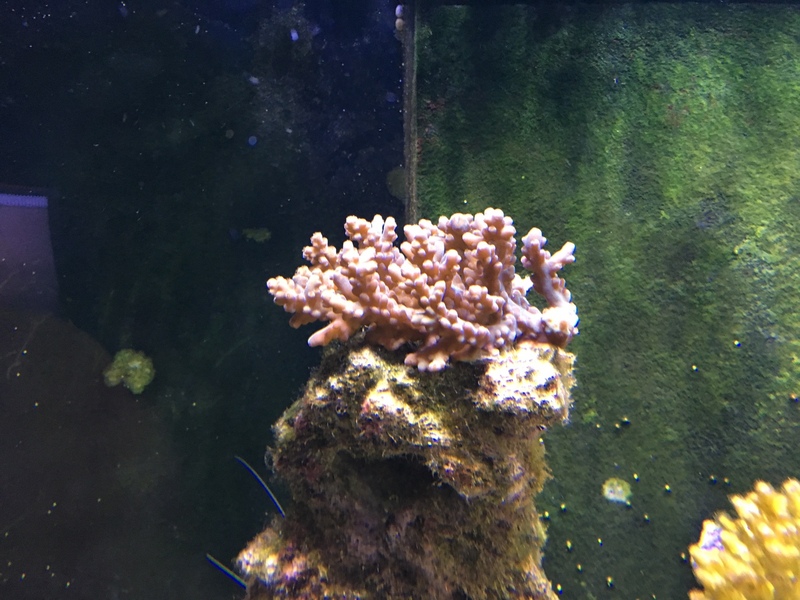 The cane coral has been in their tank for a long time and is growing out at both ends, so I frag off one end and keep the main section for a convenient hole I have. My fragging is pretty industrial (small hacksaw blade) but seems to go ok. I tell myself I need to be able to do this better in future so now I have a nice Dremel kit with a flexible head and diamond cutting blades ready and waiting for their first use. Here they are in the tank. Murphy then decides it’s my turn for his law to give me some attention. On Wednesday 10 Oct we have a power outage. Normally our power supply is very reliable, but we had a short outage 9 months ago, and now this. I can’t recall the last time prior to that that we had an outage. This one is a bad one, caused by a lightning strike and power is out for 9 and a half hours. I was at work when this happened and my wife got home not too long into it, so she dumped about 40 jugs of water from the sump into the DT over a couple of hours. I then get the return pump running off an AGV battery and an inverter we have to provide some flow. After the power comes back everything seems ok, but by Friday the cane is looking sick - RTN. Dead within 24 hours. Whether it was my industrial fragging or the power outage, or both, I don’t know. Not happy but it’s all about the lessons you learn, isn’t it, and I was expecting to learn more as I ventured into SPS. Didn’t factor in a long power outage however. This should give me 5-6 hours run time based on the UPS display. If I need to go beyond this I can either move to a 5 mins/60 or invest in a generator. My next big investment however is going to be solar power, so I decide that I will simply add in outage protection into the solar requirements. I probably won’t get the battery initially (still too expensive), just the solar, but will make sure it is battery and outage protection ready. The feedback I get is that batteries should be more affordable within 18 months. A few weeks later the middle coral colony is also dead. Again it’s hard to say what the cause was. I don’t think it was a great choice as in hindsight it was quite light in colour so may have been on it’s way out when I bought it. Or it may be my fault, or caused by the outage. The other two pieces are looking good however, and seem to be growing - can see polyp extension, reasonable colour and some growth. My water testing is showing another minor issue, which happened back in May as well - my tank is consuming Alk at a greater rate than Ca and Mg. I know that Aquaforest recommend keeping the Component 1+, 2+ and 3+ dosing the same, and adding further additives to correct any issues, but I don’t have a spare dosing head to dose more Alk and feel dosing this in lumps manually won’t be good for the tank either. So I do what I did in May and start cranking up the Alk (Component 2+). I start at 7 ml of each/day (my tank doesn’t consume much compared to big tanks) and at the moment are up to 16 ml/day of Alk - gradually raised it over several weeks. Alkalinity is now rising, 7.3, I am targeting around 8.4 before I start to back off the Alk dosing. Three further LPS went in at the end of October (Green Torch) and mid November (Trachy and Button). I’m keen to know exactly what I have, so I have been researching the scientific names of all the corals. I have what I think are the names of all the Softies and LPS but no idea on the SPS. Work for another day. As it stands now the tank is looking pretty reasonable. I had backed my NoPoX off to 1 ml/day in Sep but the GHA then started to come back so have ramped it back up to 1.5 ml/day and have been manually getting on top of it again. Here is a current video. Last edited by Tastee; 12/13/2018 at 12:30 AM. Hey Tastee Aquaristic are a good store and I've brought a few things from them, Fine Pebble Aquarium in Croydon is also a very good store and well priced, I've brought a few things from them also. How are you like the RS250 so far? I'm looking to get one next year, I'm just getting back into the hobby after a 6 year hiatus previously owning a 600L then a 300L. 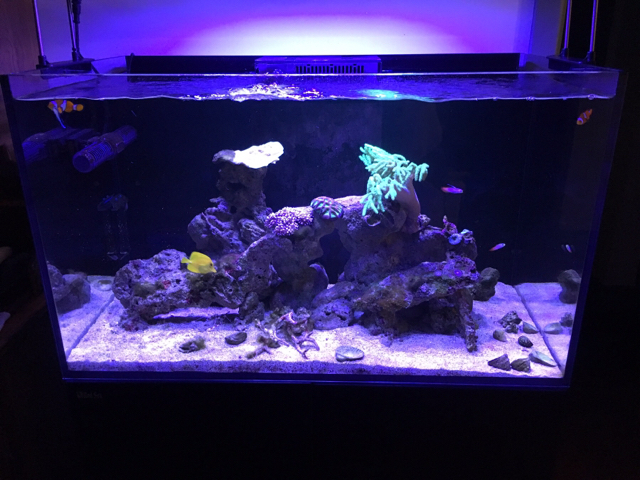 I'm currently running a 150L just to get the feel of the hobby again, a lot has changed thats for sure! I love the RSR250. The build quality is excellent and I have had no issues. 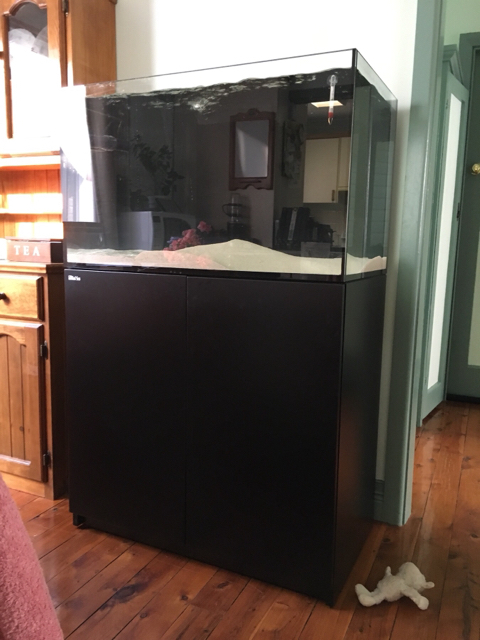 I like the height of the unit and that both presents the tank at a good viewing height and gives me enough room in the sump to fit everything I need. If I had more room I would definitely look at the larger models though.